Thanks to a suggestion from Macworld reader David Erato, I’ve spent the last couple of weeks immersed in spreadsheet applications…no, not on my Mac, but on my iPhone. David was curious how well the available iPhone spreadsheet applications worked, and whether or not any of them were worth their cost. With some help from David and some digging around in the App Store, I found five programs that all allow you to not just view, but also to edit and create, spreadsheets directly on your iPhone. So how well can a device with limited screen size and without a mouse or physical keyboard work for editing and creating spreadsheets? In many ways, better than I would have expected…as long as you realize the limitations going in and don’t set your sights too high. To evaluate these programs, I looked at four different aspects of their operation: how well does the user interface work, how do you get files on and off of the iPhone, what kind of spreadsheet files will it load (and how well does it load them), and how easy or hard is it to create a new worksheet from scratch directly on the iPhone. Despite being fundamentally the same—a spreadsheet is a spreadsheet, after all—each of the five programs took very different approaches to solving the problems of working in a small screen on an input-limited device. Each user interface had its strengths and weaknesses, but all five were actually more usable than I was expecting to find. When looking at how well these programs handled existing spreadsheets, I fed each of them four different spreadsheets that ranged from simple to complex—both in terms of functions used and formatting applied. I then made a judgment as to how well each program opened each file, based on which formulas worked and on the appearance of the iPhone version of the spreadsheet compared to its Mac-based original. 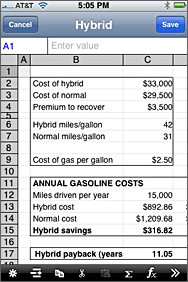 To test each program’s ability to create a new worksheet, I used Excel to create a simple worksheet that estimated the years required to recoup the higher initial cost of a hybrid vehicle, based on its improved gas mileage. The worksheet had some simple formatting, and only the most basic of functions. I then tried to recreate this file from scratch in each program, to get a sense for how easy or hard it was to create a worksheet from scratch, and to see how closely I could match the original file’s appearance. I also looked for a number of additional features—such as undo support, cut-copy-paste, and the size of the function library in each program—that make a spreadsheet program usable. I then summarized all of this data in a large table in Excel; click here if you’d like to download a copy of this sheet to look at on your Mac—it may help answer questions that I don’t address in these relatively-brief reviews. So how’d things turn out? While each program did certain things well, three really stood out for various reasons—two are the best solution for creating spreadsheets directly on the iPhone, and one—MobileFiles Pro—is the undisputed champion for working with existing spreadsheets (though it’s not so good at creating new ones from scratch). MobileFiles Pro, however, has many more skills than just opening Excel spreadsheets, so we’ll be looking at it in more detail in an upcoming standalone review. Of the remaining four programs, two didn’t quite make the grade, and two are good solutions for for creating worksheets on the go. i123’s A Crowd: A busy format screen is just one of the odd interface quirks to i123. If you need a spreadsheet application that can create charts (though it can’t view charts created in Excel), then i123 from Macrio Almeida is the program for you—it’s the only one of the five that supported charts in any way. It’s also the only program that would open Excel 2008’s .xlsx native file format. Once open, however, the files I tested had errors in function cells and/or missing formatting. One problem is that my test sheets were all imported with numeric values set as text, so any formulas using those cells failed. Beyond these features, though, i123 suffers in comparison with the other programs I tested. The user interface is odd; each time you tap a cell, you go into edit mode, and must click Done to exit edit mode—this makes it tricky to move around a worksheet without accidentally changing cells’ values. To format a cell, you first go into edit mode, then click an Edit button, and then set individual formatting options—and you must do this one cell at a time, as you can’t work with a range of cells. i123 had troubles with every one of my demo worksheets, not even handling the simple file correctly, and crashing completely when I tried to load my complex file. It won’t load multi-sheet workbooks, either, displaying only the workbook’s first sheet. Also, if you make edits then quit the program without saving, those edits will be gone when you return; the other programs save your work automatically. Creating a spreadsheet from scratch in i123 is frustrating. Every cell defaults to center-align, and changing these one at a time requires way too many taps. The program is supposed to support copy and paste (of one cell only), but in my testing, I couldn’t get it working, and the manual was of no help. Finally, there are only 27 functions available, and no absolute cell references, further limiting the program’s utility. In short, unless you absolutely require the ability to create charts, there are better choices available. 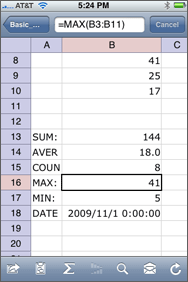 What’s Your Function: iSpreadsheet is very function-limited—COUNT, MAX, MIN, and DATE functions aren’t included so those cells appear with errors. Like i123, iSpreadsheet has a unique skill not matched by the other programs listed here—Soda's app uses Google Docs for transferring files. (It can also send files via e-mail.) You connect to your Google Docs account, and choose a file to download to your iPhone. After editing, you can then save the file locally, and/or upload it back to Google Docs. Unfortunately, that’s about the end of the list of strengths for iSpreadsheet. It’s the only program of the bunch that doesn’t support gestures to change the zoom level of the worksheet, it can’t handle multi-sheet workbooks, it doesn’t support absolute cell references, and it only offers 16 functions. Formatting options are also quite limited—you can only change the number of displayed decimals, for instance, and not the actual number format. You can’t add borders, and column widths can only be set to one of a few pre-defined widths. iSpreadsheet also had trouble with all four of my sample files, not even coming close to opening any of them correctly. 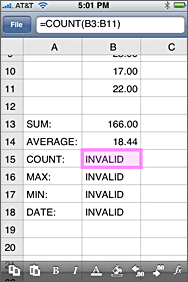 It came closest with the simple worksheet, but COUNT, MAX, MIN, and DATE functions aren’t included in iSpreadsheet, so those cells all came up with errors. When creating a new spreadsheet, I ran into the most crippling limitation of iSpreadsheet—formulas must be entered by typing a cell reference, not tapping a cell. This wouldn’t be a huge issue, except that you can’t move the window around to see the other cells; if you tap the screen, the formula entry closes. So you have to basically memorize the cell references you want to use in a given formula, which is far from ideal. Add in the fact that there’s limited support for ranges (only entire rows or columns), and creating a new worksheet is an exercise in frustration. If you need direct Google Docs support, iSpreadsheet is the only program here with that feature. Unfortunately, its performance in other areas leaves it behind the competition. If your main interest lies in creating spreadsheets directly on your iPhone, then either of the programs mentioned below will get the job done. Both offer relatively-speedy user interfaces, useful features, and intuitive operation. The choice comes down to personal preference—both Plus and Spreadsheet are quite good but have somewhat different strengths and weaknesses. Back to Basics: Plus handled the basic sheet well. Although Plus’ main strength is creating new worksheets directly on the iPhone, the app from Exitplan also did a reasonable job with two of the four demo files, and it has the ability to open multi-sheet workbooks. With 76 functions, you’ll find some Excel functions come up with errors, but many do work. Getting data onto and off of the iPhone is a bit tougher with Plus than it is with the other programs here—while you can e-mail a worksheet, the main transfer method involves a program running on your OS X (or Windows) machine called sharem. sharem is a small file server, basically, that serves up the contents of one folder (of your choosing) to Plus on the iPhone. Plus will read XML-formatted files, which you can create from both Excel 2008 and Excel 2004. You then use import and export features in Plus to move your data files back and forth. While this works, it’s much less convenient than the built-in transfer methods found in the other applications. Also, once the files are on your iPhone, you can’t save them within a folder structure; they all reside at one level, though you can rearrange them by dragging. Where Plus shines is when creating worksheets directly on the iPhone. It has a nice cut-copy-paste implementation for moving and copying cells, supports selecting and formatting a range of cells, and has an easy-to-use column/row resize feature—just click on a header and then drag a dividing arrow to change the width or height. Plus also allows you to zoom out quite a bit, making it easy to work with larger models; a search function helps find cells on those larger models. It also supports absolute cell references, giving you full control over how formulas change when copied and pasted. About the only area where Plus falls short is in cell formatting. One problem is that there aren’t as many formatting options as there are in some of the other programs. You can format a cell as currency, for instance, but there’s no way to also show the thousands separator. Similarly, you can align text horizontally, but not vertically. More annoying than the omitted formats is the difficulty in applying even simple format operations, such as making a cell entry bold or italicized. There aren’t any bold/italics buttons, so you have to actually change a cell’s font to achieve these effects; other programs make this much simpler. Finally, cell borders are supported, but if you want a box around a range of cells, you have to create it by hand—the “box” border style will draw lines within the range, as well as around it. Spreadsheet Success: Spreadsheet did a great job recreating my test file. Out of the five programs I tested, Spreadsheet from Softalk was my favorite for creating new spreadsheets directly on the iPhone. If your main interest lies in opening existing worksheets, however, Spreadsheet may not be the best tool for the job. Although it offers 73 functions, the program can’t open multi-worksheet files, and it did a very poor job with my two more-complex example files. It did, however, handle the two simplest files relatively well. Transferring files to and from Spreadsheets is done via a Web browser and the program’s built-in Web server. Using any browser, you enter a special URL that’s displayed within Spreadsheets’ transfer screen. You’ll then see a list of the Spreadsheet files on your iPhone, and you can use a Browse/Submit feature to upload additional files. This transfer method is much simpler than that of Plus, which relies on a helper program on your Mac. As with Plus, Spreadsheet only reads XML-formatted worksheet files. 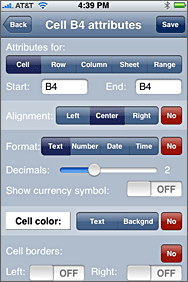 When it comes to on-the-iPhone spreadsheet creation, Spreadsheet is quite similar to Plus in many ways. It allows a low zoom level (so you can see a lot of your worksheet), has a search feature, supports cut-copy-paste, offers absolute cell references, and allows selecting and working with a range of cells. Of the programs that support pinch gestures for zooming, Spreadsheet had the smoothest zoom action—the screen redraw is very fast and fluid as you zoom the view in and out. You can even freeze panes (which you can also do in Plus) to keep certain rows and columns on-screen as you move about. Easy Operator: This one-row controller (normally spread across three screens) eases cell operations. But where Spreadsheet really shines is in working with cells and ranges on your worksheet. Along the bottom of the screen is a row of buttons for commonly-used functions; it’s actually three screens wide, so an arrow at the end of each row takes you to the next screen of functions. In the image at right, I’ve stacked all three of these command bars atop one another.